Privacy on Facebook isn’t a one-time thing. Because you are constantly adding new status updates, photos, and content to Facebook, constantly interacting with friends and reaching out to people, privacy is actually an ongoing affair. To that end, one of the most common places you should know your privacy options is in the Share box. The Share box is the blank text box that sits at the top of your Home page and under your cover photo on your Timeline. It’s where you go to add status updates, photos, links, and more to Facebook. The part of the Share box that’s important is the Privacy menu, right next to the Post button. Whenever you’re posting a status or other content, the audience, or group of people you’ve given permission to see it, is displayed next to the blue Post button. The audience you see displayed is always the audience you last shared something with. In other words, if you shared something with the Public last time you posted a status, it displays Public the next time you go to post a status. Hovering your mouse over this word turns it into a button. Click that button to reveal the drop-down menu. It shows a few options: Public, Friends, Friends Except Acquaintances, Only Me, and Custom. 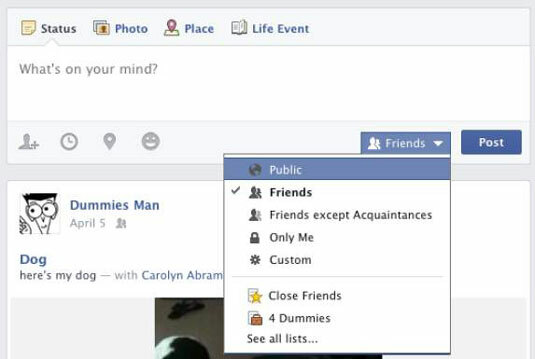 Additionally, if you use Friend Lists at all, commonly used ones appear below the usual privacy options. Click the setting you want before you post your status, link, or photo. If you do share something publicly, remember to adjust the audience the next time you post something. Sometimes, you may find that you want to share something with only a portion of your friends. To do that, choose Custom from the Privacy menu. The Custom Privacy window appears. 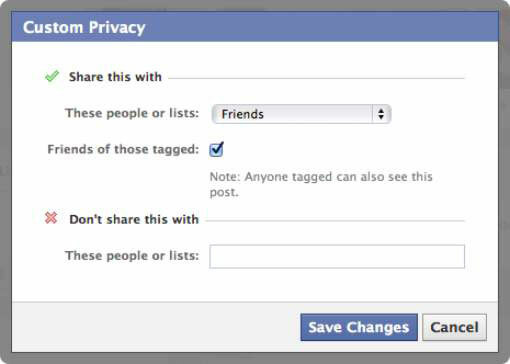 Friends of Friends: This means your friends and their friends can see whatever you post. Friends: This option allows only your friends to see what you post. Specific People or Lists: Choosing this option opens a blank text box. You can start typing a name or the name of a list of friends here. After you save these settings, only the people you’ve entered can see your post. Only Me: This option isn’t one you’d typically use for a post, but you might use it later on if there’s any information you want to store on your Timeline but you don’t want to share with others. Additionally, when you choose Friends of Friends or Friends, a check box allows you to choose whether the friends of any people you tag can see your post. Remember, tagging is a way of marking who is in a photo, who is with you when you check in someplace, or whom you want to mention in a post. Say that you’re going to spend a day at the park with a friend. You might post a status that says “Taking advantage of the nice weather with Kate.” The name of your friend links back to her profile. By default, Kate’s friends will be able to see this post, even if they aren’t friends with you. If you deselect this box, Kate’s friends can no longer see that post. The lower section of the Custom Privacy window controls who can’t see something. Similar to the Specific People or Lists setting, the Don’t Share This With section has a blank text box where you can type the name of people or lists of people. When you add their names to this box, they won’t be able to see the content you post. A post’s privacy icon is visible to anyone who can view that post. People can hover over that icon to get more information. Friend Lists appear as Custom privacy unless the viewer is a member of a list you shared the post with. Members of a default or a custom Friend List can see other people included on the list, but are unable to see the name of the list. Hover your mouse over the privacy icon at the top of the post whose audience you want to change. Every post displays the icon for Public, Friends, Friends Except Acquaintances, or Custom. Click the button to reveal the Privacy menu. You’ll see the usual options: Public, Friends, Friends Except Acquaintances, Custom, or specific Friend Lists. Click the audience you want. A change to Public, Friends, Friends Except Acquaintances, or a specific Friend List is automatically saved. Changing to Custom requires you to make selections within the Custom Privacy window again.